The date is set for this year’s Student Association election, and while the second week of March may feel like a long way off, the campaign season will soon kick into high gear. Over the next few weeks, students will begin announcing their candidacies for president and executive vice president, and campus will be buzzing with preparation for the election. Around this time of year, it’s important for students to remember that they hold all of the power in the SA election. While theoretically the student body has an opportunity to shift the SA’s legislative agenda through their votes, the election usually ends up feeling like a popularity contest based on flashy proposals, pretty posters and well-designed web sites. But this year, students should look past the surface and take a hard look at the candidates’ stances on the issues. Based on past campaign platforms along with the news from this academic year, we’ve narrowed down what we think are the biggest topics the candidates will be discussing this spring, and how students can navigate them. Over the past year, GW’s sweeping budget cuts have been some of the biggest news on campus. And with University President Steven Knapp’s announcement of yet another round of cuts in December, GW’s financial situation is likely to come up on a few SA candidates’ platforms. This, of course, is an easy issue for candidates to bring up. Reminding students that they’re angry about cuts to certain departments is a great way to garner some attention. But any candidate’s promise to fix the budget shouldn’t be taken seriously. 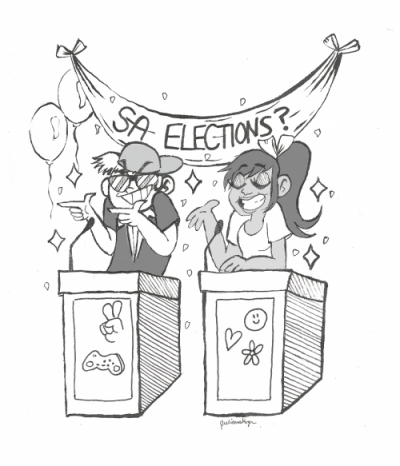 When evaluating candidates, students need to keep in mind that while the SA’s leaders can relay students’ concerns to University officials, they have virtually no control over the budget and not much say in what gets cut. And students should look out for platform pieces that will cost a lot of money, too – like construction proposals or spending on student space. Three years ago, SA President Julia Susuni vowed to move the counseling center from K Street to campus. She succeeded with that ambitious goal, but next year’s SA president will be constrained by GW’s financial limits, and lavish spending simply isn’t a realistic goal. When former SA Executive Vice President Casey Syron resigned earlier this month, he left behind an unfinished goal: to make costs on campus lower for students. Since Syron made this one of his priorities, we can expect SA candidates to try picking up where he left off. This year’s campaign platforms will probably include small-scale affordability measures – easy and tangible goals that will get students excited. Smaller affordability initiatives like free printing, low-cost laundry or cheaper food options would undoubtedly make a huge difference in students’ lives, which is why candidates will likely propose them. Students only need to look back to last year’s election, when SA presidential candidate Ben Pryde proposed converting J Street to a swipe system to make meals more affordable. But students should be careful not to base their votes on something like the promise of cheaper dining or free printing. Of course, candidates who have been involved in the SA might have the institutional knowledge to try pushing these ideas through. But GW’s budget cuts could hamper any affordability initiatives. University Police Department Chief RaShall Brackney has said that one of her main goals is to improve the department’s relationship with students. Her willingness to engage with the student body – even setting up times for UPD officers to chat with students over coffee – presents an opportunity for SA candidates to propose new safety and security measures that may actually see some success. Every year, we see the same bullet points on candidates’ platforms: improvements to 4-RIDE and more blue lights. During her campaign last year, for example, SA President Andie Dowd made increasing 4-RIDE’s efficiency a big piece of her platform. But this year, students should consider what actually makes them feel safer on campus, rather than settle for the same old proposals. There are some relatively high-crime areas surrounding campus, and we know from last year’s campus climate survey that about one in five freshman women felt unsafe on campus at night. Students should look for the candidates who are directly addressing those fears – and for the candidates who are taking advantage of Brackney’s openness to propose different and interesting security measures. This academic year, we’ve witnessed a national conversation about social issues on college campuses – particularly when it comes to race and political correctness. And given the attention to these issues on our own campus, it’s very possible we’ll see buzzwords like “microaggressions” and “trigger warnings” brought up in at least a few platforms. The SA president and executive vice president act as the student body’s voice – the ones who tell officials how we feel about social issues on our own campus. This past semester, we’ve seen the SA do just that by commenting on issues like Bill Cosby’s honorary degree. Over the next academic year, we’re bound to see more social issues popping up on our radar at GW. That makes candidates’ meetings with student organizations particularly important, since there are many groups on campus that prioritize certain social issues. Students should do their best to choose candidates who line up with their own stances on social issues so that they feel like they’re well-represented by the SA leadership when it comes time for the SA president to act as the student voice. It’s no secret that the University has prioritized improvements to mental health resources over the past few years through initiatives like moving Mental Health Services into the Marvin Center, adding counseling to the Mount Vernon Campus and hiring more counselors. But that doesn’t mean our campus is through talking about the issue. Right now, there’s an opportunity for SA candidates. Last semester, we learned that former MHS Director Silvio Weisner was not licensed to practice as a psychologist in D.C. Now, one freshman’s family is suing GW after he died by suicide in 2014. The next SA president will have significant political capital over the administration, and may be able to push through even more campus mental health reform. But before casting your vote for anyone who proposes to completely overhaul MHS, remember how many sweeping changes we’ve already seen over the past few years. Smaller ideas, like adding students to an advisory board to help choose the next director of MHS, are a lot more realistic. The results of the University’s first sexual assault climate survey were released about this time last year. And since GW conducted another survey this past fall, hopefully we’ll get those results this semester. If they’re released before the election, it’s important for candidates and students to read and remember the numbers. While we can hope that the numbers will be better than last year’s, GW needs to continue the fight against sexual assault no matter how much, or how little, things have changed. Candidates will likely ground their prevention policies in details from the survey, and students should come into the election knowing what their priorities are, too. There have already been big pushes for sexual assault prevention, like bystander intervention and in-person prevention trainings, but GW is slowly shifting its attention toward resources for survivors. Rather than looking for a candidate with bold new ideas, students should look for those SA candidates who can get behind and build on the ideas the University already agrees with – like improving Haven, a sexual assault resource website – so that that things get better quickly.